As a coach, you work really hard to figure out what it really takes to make your crew faster. No matter what, on some level it's guesswork. 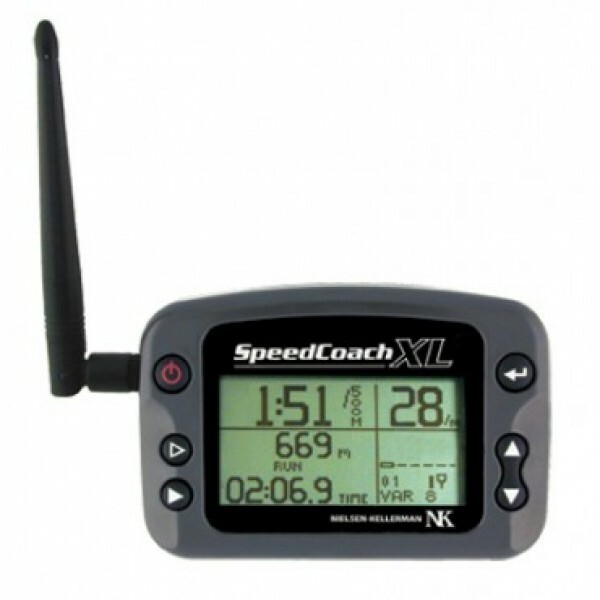 NK has changed that with the revolutionary SpeedCoach XL3. Please choose your bumper colour from the options below. As a coach, you work really hard to figure out what it really takes to make your crew faster. No matter what, on some level it's guesswork. NK® has changed that with the revolutionary SpeedCoach XL3. The SpeedCoach XL3 incorporates a powerful digital spread spectrum transceiver capable of sending and receiving all of a crew's performance information in real time, up to 400 meters away. Buy two SpeedCoach XL3's—one for the shell, and one for your launch—and you'll be able to see your crew's speed/pace, distance, time, average speed/pace, stroke rate and stroke count updated on your coach unit every stroke, in real time. Add more XL3's for other boats and continue to monitor them with just one coach unit—you can page between data screens for up to 9 boats in your network. (You can assign each boat a 5-character name to facilitate review.) To monitor more than one crew without changing screens, or to allow other coaches to monitor the same crews, simply add more units to act as receivers. Advanced network security ensures that only you see the boats in your network, and that there's no interference between XL units, even on busy rivers. 1,500 Data Point Memory for "Just Row"
500 Data Point Memory for "Workout"
To compare functionality of units, please visit our full Product Function Comparison Chart. Clock & Calendar: 12- or 24-hour clock, auto day-date-year calendar with leap year adjust. Chronograph: 0 to 99:59:59.99 with auto roll-back, 1/100th sec. resolution. Stroke Rate: 1/2 SPM resolution, autostart with first stroke, rate input from seat sensor or speed sensor. Stroke Count: Up to 99, 999, then rolls back to 0, automatically starts with first stroke. Distance: Meters, kilometers, miles, nautical miles. Speed: Meters per second, knots, miles per hour. Pace (Predicted Split): Per 500 meters, mile or nautical mile. Memory: Stroke rate, time, average speed and distance for 1000+ user-defined memory points. Programmable Workouts: 5 workouts, up to 20 intervals each. Wireless Data Transmit/Receive: Up to 9 boats and infinite coaches on a network; 3-mile range. Computer Upload: With optional serial or USB interface. PC — upload, download and charting; Mac — upload and download. Software: PC compatible, built-in charting. Emergency Beacon: Notification of emergency to any XL-3 or XL-4 on any network within range. Case: Injection-molded polymer case, acrylic lens. Controls: 6 buttons (front), context sensitive, tactile and audible response. Battery Life Expectancy: 72 hours constant use, 25 hours with constant backlight. Charges in under 3 hours. Power Conservation: Auto-off after 17 minutes of inactivity. Size: Control unit:4.5 x 3 x 1.5 in (114.3 x 76.2 x 38.1 mm); Antenna: 7.25 in (184.15 mm). Weight: 8.9 oz (252.3 g). System Weight: 13.8 oz (391.2 g), (1x harness + T-bracket). Water Resistance: Waterproof (IP67, NEMA-6), floats. Buoyancy: Control unit with antenna, bumper and lanyard floats.